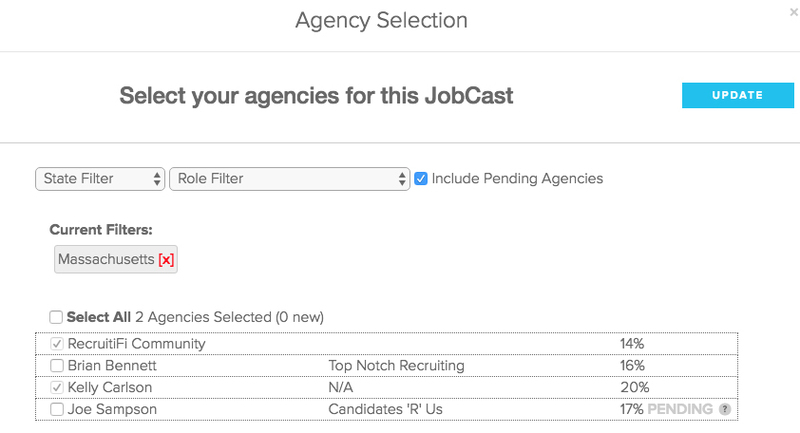 As you're sending a JobCast, you can select which of your Legacy Agencies to send the role. After you've sent the JobCast, you can still go back and add one of your existing Legacy Agencies or the RecruitiFi Community. 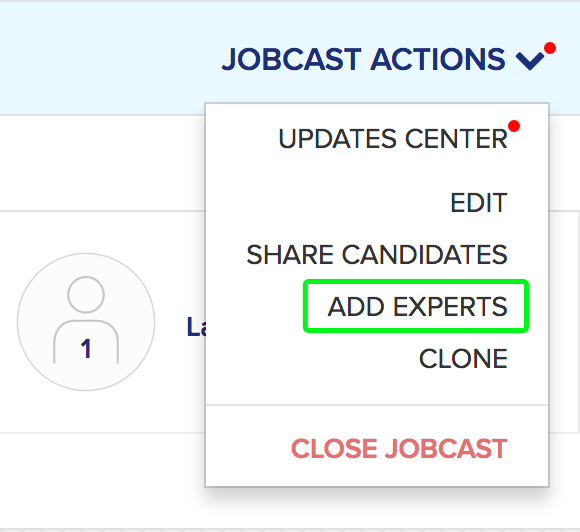 From your dashboard, go to the "JobCast Actions" menu in the upper righthand corner of the JobCast and select "Add Experts," as noted below. This will pop up a screen with additional information about your legacy agencies like the one listed below. Check the boxes next to any of your Legacy Agencies or the RecruitiFi Community and click the "Update" button to invite them to participate on your JobCasts. By default, it will list all the agencies who have said that they provide candidates in the location of your JobCast. If you'd like to see the full list of your agencies, click the red "X" next to remove the state or country under "Current Filters." This screen also lists all pending agencies by default. These are agencies who have been added to your legacy list, but have not yet signed up for RecruitiFi. If you'd like to only see your active agencies, uncheck the box next to "Include Pending Agencies." Note that you can still check the box and add pending agencies to your roles, which sends them a reminder email invitation with details on your specific role. This notification shows your agency that there is a live role for them to work on, incentivizing them to activate and start sending candidates. We highly encourage you to invite your pending agencies to JobCasts in order to expedite the process of onboarding your legacy agencies.